In October 2018 I traveled to Europe to attend my sister’s wedding in Paris. I took advantage of the occasion and prolonged my trip to visit several other cities, including: Lisbon, Portugal, Marrakech, Morocco, Amsterdam, Netherlands and Stockholm, Sweden. 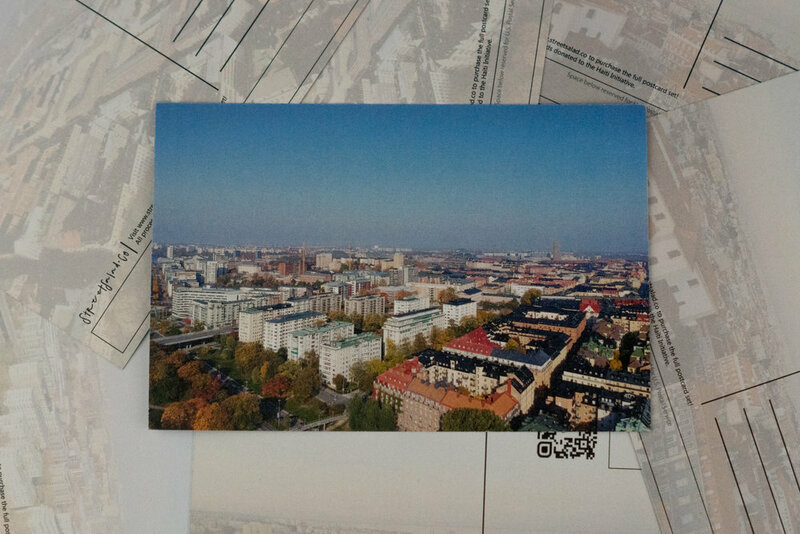 For my StreetSalad postcard collection, I decided to print drone photographs that I captured in Stockholm and Lisbon. The photographs and clips from Stockholm are from two different locations. The first is from the excursion to Kronobergsparken, a park really close the Airbnb where I stayed on my trip. The park is in Fleminggatan, which is a more residential island/neighborhood in Stockholm. I launched the drone from a basketball court in the middle of park. It couldn’t have been more ideal. It was around 11:00 AM (after a nice brunch at Café Blåbär, a local eatery) and the sun was making its appearances over the park on a hazy autumn day in Stockholm. The second set of photos are from the excursion to Rålambshovsparken park. Rålambshovsparken (Rålis) park is in the Marieberg district in Kungsholmen, Stockholm. It’s close to a main highway that leads to another island, Langholmen. I stumbled onto the park somewhat accidentally. There was a skateboarding section within the larger park. I wanted to experiment with capturing skateboarding footage. After catching some shots from the skateboarding park, I launched the drone from Smedsuddsbadet, a walking trail at the end of the park. There, I captured some footage of Riddarfjärden, the easternmost bay of Lake Mälaren in central Stockholm. Stockholm is a refreshing city to visit. I’d recommend to walk as much as possible (depending on the time of year you’re visiting). I was visiting at the end of the fall and it was still sunny out. I took advantage of the good weather and fresh air. It’s one of the cleanest cities I’ve ever visited. It’s more of a chill city … cool architectures, pubs/bars, island hopping etc., so there’s plenty to see and do. I personally enjoyed my time at the Nobel Museum,. It is located in the old town in central Stockholm. There’s a cluster of great restaurants, old churches and historic buildings to check out in that area. Next time, I’m in Stockholm, I’ll definitely spend more time in Södermalm, which is an island that has a more relaxed, creative vibe. There are artsy shops, eclectic cafes, and a youthful feel. I spent an evening Södermalm and definitely felt good vibes and positive energy. Marc has chosen for all postcard profits to be donated to Anything Is Everything. Anything is Everything is helping support youth education in Liberia. AIE was founded in 2016 as a charitable campaign geared towards youth development in Liberia through education. One of its core goals is to provide at-risk Liberian youth access to the necessary tools and opportunities to pursue a better life for themselves and their families. Marc is an energetic and intellectually curious professional. He works at the intersection of Finance and Technology. Marc is a native of Port-au-Prince and grew up in Connecticut. He enjoys traveling but takes deliberate trips - you have to be cost effective! He’s excited to make more trips to Africa in the upcoming years. He's passionate about economic development and strongly believes that new and innovative institutions can and should play a major role in improving people's lives. Marc is passionate about entrepreneurship and loves to support the entrepreneurial ventures within his network.